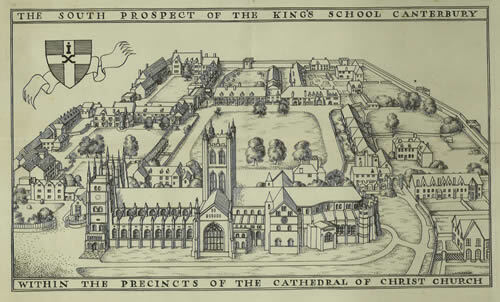 The School is mainly based in the Precincts of Canterbury Cathedral and at St Augustine’s. It also uses nearby buildings in the city. The Tour centres on nine main areas: The Mint Yard, Palace Court, The Green Court, Broad Street, The Brick Walk, St Augustine’s, Blackfriars and Radigunds, Blore’s (Recreation Centre) and Birley’s. The history of the buildings in the Precincts is fully described in Margaret Sparks, Canterbury Cathedral Precincts: A Historical Survey. An interesting earlier account is in William Gostling’s A Walk in and about the City of Canterbury, first published in 1774.